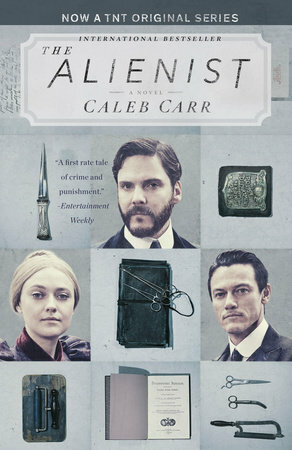 The Alienist, the 1994 detective novel by Caleb Carr, was a bestseller in its day. Now book sales may go through the roof again due to the TNT network’s new television series of the same name. You have probably seen it in stores with the stars of the TV series gazing from the shiny new covers displayed on the shelves. The Alienist introduced an unforgettable cast of characters including the alienist himself, Dr. Laszlo Kreizler; his friend newspaper reporter John Schuyler Moore (he whose Dutch name evokes New York history); their friend, Sara Howard, who broke the glass ceiling of the secretarial profession (a previously male domain) at the NYPD; and Cyrus Montrose and Stevie Taggert, who have worked for Kreizler ever since he saved them from life crises in the period before the novel begins. Cyrus and Stevie have real jobs working for Kreizler, but in addition, Cyrus provides the team’s muscle while Stevie has the necessary stealth and street connections that come with the territory this book covers. The story is set in 1896 Manhattan. The atmosphere ranges from tense demonstrations of power in the halls of money, church, and government to the seamy surroundings of new immigrants and seasoned New Yorkers occupying the city’s teeming tenements, navigating its grimy streets, and nightly filling its notorious brothels. Fortunately, dinners at Delmonico’s provide the alienist, his collaborators, and the reader with periodic respites from the ghastly crime scenes, political maneuvering, and surly thugs who try to control Kreizler’s investigation in order to preserve various dimensions of the criminal status quo. In this work of fiction, it was New York City Police Superintendent Theodore Roosevelt who brought Kreizler and his team in to investigate a series of murders involving the killing and mutilation of cross-dressing boy prostitutes. Roosevelt knew Kreizler and Moore from college at Harvard; they are now old friends working together with affection and trust. During the time of the story, Roosevelt was the new superintendent trying to improve the police department with his eye on cleaning up corruption, misbehavior, and poor performance. Another historical character, the pioneering American psychologist William James (who they knew as a Harvard professor) does not actually appear as a live character, but is cast as a memory whose role is a shaper of thought and character. The term alienist in this period of time meant a psychologist: Kreizler himself was an alienist becoming what is now called a criminal profiler. His research and applications were controversial to powerful people, which meant that Roosevelt’s initiative in starting this investigation could bring his own political downfall unless he conducts it as a shadowy parallel of the official (and ineffective) police investigation. Sara’s job as a police secretary assisted with this, since she had an unquestioned reason to be in the police department. In addition, Roosevelt quietly assigned two young police detectives, the brothers Lucius and Marcus Isaacson to help Kreizler. The brothers proved eager to assist, especially because their innovative forensic techniques were actively resisted by the old guard in the police department, at least some of whom also didn’t like that they were Jewish. This is a book you can sink your teeth into. It is 484 pages long and unfolds as the investigators learn that they are tracking someone who, like Jack the Ripper and W.W. Holmes hunted and killed human victims in London and Chicago ca 1888-1893. The Ripper and Holmes are quite credibly on people’s minds in this story (newspaper reports concerning Holmes are periodically mentioned due to the killer’s execution in May 1896, several months into the story). Kreizler’s team also deduces that the killings are predictable in a way connected to religion, which I will not discuss further as I try to avoid spoilers, and even tidbits of specific information concerning clues the reader will ponder while turning the pages. Nonetheless, deducing who the killer is and where he will strike are, to say the least, eventful. And so the story works through the months of murder and mutilation, the side trips, the interviews, the discoveries, the attacks, the confrontations, the near-confrontations, death and near-death, the grim encounters with evil. It is fair to ask why The Alienist is reviewed in an archaeology blog. I suppose that part of the answer is that The Alienist is the kind of book an archaeologist reads in his or her spare time, when he/she is off-duty, between archaeological surveys, chili on the stove, reading while the cocoa is warm in the mug and it’s snowing outside the window. A broader answer may be an analogy that at least one archaeology professor has made (but that I suspect numerous archaeology professors have made): “Archaeology is like detective work.” I, a reader of Kay Scarpetta novels and The Hound of the Baskervilles, have never been prepared to argue against this view. But I would make 3 further points. First, because of its nature, forensic science appeals to archaeologists, and archaeology increasingly has a lab-science forensic aspect. Meanwhile, crime scene field investigations have converged toward archaeological techniques, as we can learn quickly from a chapter or two of Marilyn Johnson’s Lives in Ruins (or more casually by watching CSI reruns). Second, while Patricia Cornwell’s Scarpetta series pioneered forensic investigation as a significant dimension of detective stories, The Alienist (written roughly contemporary with the early Scarpetta novels) has imagined forensic science as applied to criminal investigation in its infancy, set 90 years before the first Scarpetta story. Of interest to anthropologists and archaeologists in particular, Alienist author Caleb Carr uses his characters Marcus and Lucius Isaacson to bring to this narrative the late 19th century anthropometric method of the French researcher Alphonse Bertillon. The Issacsons also employ fingerprinting, a method then regarded as too controversial and unproven to introduce as actual evidence, but something the Isaacsons consider could unofficially guide an investigation. The general context of this is fascinating: in the era when the book is set, anthropometry trumped finger-printing as a method to provide evidence in criminal investigation and prosecution. In the specific context of The Alienist, anthropometry had become widely accepted in Europe, but was actively resisted by the NYPD due to entrenched interests in less rigorous methods that did not require detectives to measure things. Third, famous anthropologists show up in the novel. Teddy Roosevelt is not the only historical figure to become a walking, talking character here. Franz Boas and Clark Wissler are two of the others. As part of the investigation, Kreizler and Moore stop by the American Museum of Natural History to interview Boas and Wissler about the possibility that the killer is Native American, or whether the mutilation of the victims could have been inspired by American Indian practices. As I said, no spoilers here, so that is all for now on the anthropologists…All except to say that the anthropologists’ response sent the investigation in an important direction, while their ethical position on the Indian questions will resonate across time for archaeologist/anthropologist readers. In 1994 The Alienist was a best seller, which is no small achievement. Now it is poised to become a bigger thing, in different measures because of television and the discovery of this book by a new generation of readers. For the new generation of readers, or those who have not followed Kreizler’s adventures beyond The Alienist, there is really good news: Carr wrote a sequel called The Angel of Darkness (1997), introducing a new killer and transporting Kreizler’s team to the Village of Ballston Spa, seat of Saratoga County, New York. Also, after a long hiatus in the Kreizler saga, Carr published Surrender, New York in 2016. Surrender, New York tells the story of present-day detectives taking a Kreizler approach to their work. Surrender, New York is the fictional name of their little village. I wonder where on earth (between Saratoga Springs and the Town of Easton, in the greater Schuylerville-Victory, New York vicinity) that is? Finally, internet searches will show you that there may be one or two more Kreizler novels in the works. Carr told the story of The Alienist with John Moore as the narrator, and The Angel of Darkness from Stevie Taggert’s perspective. Who will narrate the next story? I’m putting my money on Sara Howard. It won’t likely be Laszlo Kreizler. Wouldn’t it be totally un-Sherlockian for Kreizler to tell the story?